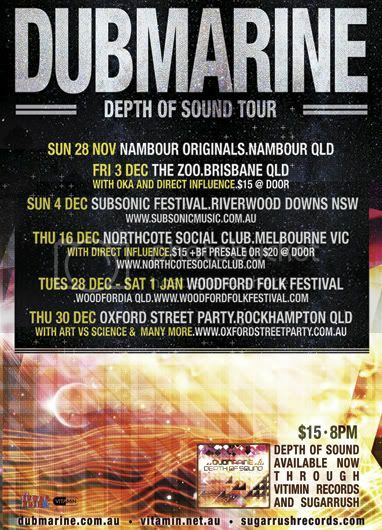 Dubmarine are hitting the road launching the new LP Depth of Sound! Details below - love to see ya'll at one of our shows! Check out one of our tracks off the album! Sound the alarm! Australia’s high-powered dub and dancehall sub-bass vessel Dubmarine are taking the wraps off their much-anticipated debut album Depth of Sound! Featuring their trademark bass-driven foundations, twin trombone blasts and thunderous synth explosions, Depth of Sound will be available in stores November 9 through Vitamin and online everywhere through SUGARRUSH. The album’s release comes at the tail end of what’s already been a huge year for Dubmarine. July saw them complete a massive month long European festival tour (Germany, Belgium, Netherlands and the Czech Republic) before turning in a pair of unforgettable sets at September’s BIGSOUND conference back on their home turf. To date, they’ve carved up the stage at the Woodford Folk Festival, The Dreaming Festival, Parklife, Island Vibe Festival, Colours of Ostrava (Czech Republic), Amsterdam Roots Festival (Netherlands), Munduial Festival (Netherlands), Trier Alstadfest (Germany), Wereldfest (Netherlands), Afro lation Festival (Belguim), AWME (Melbourne), Reggaetown (Cairns)… and more. Live, Dubmarine are nothing short of a phenomenon. Over the last couple of years, the band has done it the old fashioned way, earning themselves a must-see reputation through a relentless touring and festival schedule. Led by the vocal gymnastics of indigenous superstar and Darumbal man D-Kazman, the nine piece create deep dancehall, reggae, dub, and drum and bass rhythm pandemonium on stage, producing the sound and fury of electronic music, in all of its bass crunching, rhythm pounding, hip shaking fiendish glory – on live instruments. And it is this unmistakable live energy that’s been captured and bottled on Depth Of Sound by local collaborator Andrew Stephens. The record is evidence of a band growing in strength and confidence, and one more than willing to take some creative risks. First taste from the record – the track ‘Chip’ – has paved the way for the full album, earning solid support from key radio nationally including Triple R, PBS, 4ZZZ, FBI and RTR. Depth of Sound will be launched with a run of dates up and down the east coast, followed by a string of festival slots including the Woodford Folk Festival, Subsonic (Barrington Tops, near Sydney), and the Oxford Street Party (Rockhampton).